I’ve written before about one of my classroom rules: “Refuse to be Bored” and taken a second look at it as well. That rule asks students to speak up to make the class work better for them. Immediately, the spotlight is on Duncan. Many eyes turn in his direction, and I pause expectantly. If Duncan has an opinion, and is willing to share it, he will take this chance to express it. But if he doesn’t want to say anything, he certainly doesn’t want to sit there in the spotlight. So he says, “I pass,” and I move on. I call it a classroom rule, because students expect there to be rules, but I think of it as a covenant or a commitment that I make to students. I agree to get them out of the spotlight whenever they say that’s what they want. I think of it as a covenant, and I keep my word absolutely. When someone says, “I pass!” I move on to the next person or to the next item on the agenda quickly and without comment. I move the spotlight on to someone or something else. 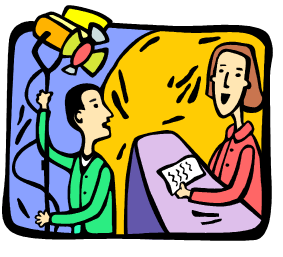 I NEVER say something encouraging, like, “I’m sure you can do this one if you give it a try,” or “This is just like the questions we did yesterday.” That would keep the spotlight still on the student who has just told me to move the spotlight along. It would mean I was breaking the covenant. What does this rule do for students? It reduces the anxiety level for students who worry about being suddenly called on to speak in class. When they know they can pass, they are less anxious and can pay more attention to what is being taught. It allows students to assess the risk of answering a question or making a contribution to a discussion; since all learning requires some risk-taking, it is better that the student assess the risk, rather than I. It allows students to sit in a class without participating. This makes it possible for them to get a sense of the level of the class and the ability of other students, to see where they fit in. They get a sense of the culture of the class–what happens when someone makes an error? How safe is it to admit you are confused? When they feel safe, they will speak up. Until then, they can still be in the class, do the work assigned, and make progress. What does the rule do for me? It gives me immense freedom from having to take care of students’ feelings, because the rule allows students to take care of themselves. I often hear caring instructors of adult ESL and Basic Education say that they don’t ask people to read aloud because it might embarrass them, or that they don’t like to put students on the spot by calling on them in class, in case they can’t answer. I don’t have that problem. I am free to move discussion along in a lively manner, to invite people to participate, to make connections with outside interests or expertise I know students have, and to raise the bar high for student achievement. It eliminates that awkward pause, and saves me from making the blunders that come with it. You know the pause, where I say, “What do you think, Janet?” and Janet looks down at her desk and there is silence. Then I start to feel tense because I don’t know what’s going on. Does Janet not know the answer? Is she thinking? Does she need a hint? Is she too embarrassed to look up, or is she visualizing the diagram that she’ll use to answer the question? As the silence goes on, I get embarrassed because I don’t know how to break it–really, Janet should say something next, because I asked the question. It’s not my turn to talk, but maybe I should because it looks like Janet might not say anything. It seems I am losing control of the situation, and I start to get worried. The spotlight is suddenly on me, because everyone is looking at me and Janet, and expecting me to do something–and there, in that mix of tension and embarrassment and confusion about what is going on, I am tempted to do something that will make me feel better, no matter what Janet needs or wants. That is where I will make the blunder: I may speak too soon, before Janet has time to finish thinking. Or I may ask another question, meant to be helpful but which only causes Janet confusion. I may shut Janet down too soon by going on to someone else. Or make a sarcastic remark to put Janet in her place. The rule keeps me safe from making that blunder. If Janet says, “I pass,” I go on to another student. If Janet doesn’t say, “I pass,” it means an answer will be forthcoming, and I can calmly let the silence go on until she speaks, either to give a response or to ask for clarification. The “pass” rule gives me useful information. If someone always passes on the opportunity to read his own stories to the class, then one day reads instead of passing, it tells me a victory has been won. If people who generally participate without any hesitation start passing on a given day, it tells me that I probably need to review or re-teach the material we’re working on. Why does this rule work? It works because it gives the student control. It works because it’s cooler to say, “I pass,” than to be embarrassed when you don’t want to talk. It works because it eliminates guesswork. It works because it leads to livelier classes and a less-stressed teacher. I appreciate the benefits of this ‘rule’. I wonder how I could get those same benefits while working one-on-one with a student. The benefits from this rule mainly come from giving the student control and choice. When you’re working one-on-one with a student, it is easier to give them choice and control, because you don’t have to take other students’ needs into account. To eliminate those moments when you’re marking work with the student, and you ask a question and get no response, I use marking for confidence. You’ll find some videos and articles here. Do these things help, or have I misunderstood your question? That helps a lot for marking. It just seems to be easier to implement when working as a class, so that a student knows that a ‘pass’ means you will move on to another student. If a student is reluctant to discuss something (a concept or something they have read, for example), it is awkward when it is not a group discussion. I tend not to push participation — that’s why I like this ‘rule’, but I don’t always feel effective with people who then don’t seem to participate very much. My mind went off on a little riff at one point in this piece (which is clear and interesting, as usual) to take up the question of sarcasm in the adult literacy business. Sarcasm is confusing because it depends on playing with words and usually faking an emotion through your tone of voice. Neither of these are common strengths among the students and, I’ve found, many others as well. I can’t imagine talking without sarcasm. I enjoy it and often laugh or smile in response. But a common reaction if I am trying out sarcasm on someone I don’t know very well, is they think I have misunderstood them. Well our students very often go first of all to “I’m stupid” when they are in a situation they don’t understand. I don’t want that so I learned to control it when teaching. I have also tried to explain sarcasm and why a certain thing I said was sarcastic and my students often went to la-la land during the explanation. Try explaining it sometime to someone who isn’t naturally witty and you’ll see what I mean. Thanks for this riff, Evelyn. Sarcasm is a whole other country. And explaining a sarcastic remark is as hard as saying why something is funny. Like the boys from the Big Bang Theory, we need a “sarcasm” sign to hold up when we are being sarcastic. I see you put one in your last sentence.